If you take control of another person's property by using deception, or simply appropriate lost or misdelivered property or services, it is considered theft. In Washington State, the severity of a theft crime is directly linked to the value of the stolen or misappropriated goods and/or services. This means that stolen property that's higher in value will result in a more serious criminal charge with more severe penalties. If you or someone in your family is charged with any of the many theft crimes listed in Washington criminal code, you should contact a lawyer immediately and make sure your rights are protected. If you're convicted of a theft crime, you could be facing a lengthy prison sentence. You will also acquire a criminal record, which is something that will follow you for the rest of your life. Every time you apply for a job or fill out an application to rent an apartment, a quick background check will reveal that you are labeled as a thief. Do you think that designation will give you an advantage over other applicants? Our Bremerton theft lawyers can help you address these serious charges, and the information offered below should provide you with some simplified information relative to your case. 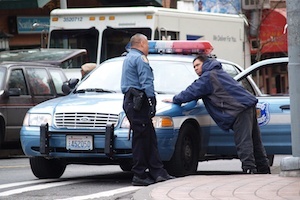 What is Theft and how are Convicted Thieves Punished in Washington State? There are other theft crimes that could be added to this list as criminals are always thinking of new ways to get something for nothing. Because these crimes adversely affect the lives of innocent people, prosecutors in Kitsap County will often seek maximum punishments and show little mercy. You can be charged with many theft crimes even if intimidation or violence was not used to commit the crime. Walking out on a restaurant tab or shoplifting are two examples. If a package addressed to someone else is delivered to your home and you keep it, this is also considered theft in the eyes of the law. The dollar amount of the stolen property determines the severity of the crime. First degree theft is a Class B felony and a conviction could lead to 10 years in prison and $20,000 in fines. Second degree theft is a Class C felony and a conviction could lead to 5 years in prison and $10,000 in fines. Third degree theft is a gross misdemeanor and is punishable by 264 days in jail and $5,000 in fines. The value of stolen goods is less than $750 – Third degree theft . The value of stolen goods is between $750 and $5,000 – Second degree theft. The value of stolen good is more than $5,000 – First degree theft. Other factors may influence the severity of the charge. For example, if a firearm was used during a robbery, or a weapon was used to intimidate a victim, additional charges will likely be added. If an automobile or firearm was stolen, other charges may also be added. Victims often seek compensation via civil lawsuits, and business owners may also sue for restitution. With so many variables, you should speak with one of our Bremerton theft lawyers and make sure you fully understand the charges against you. Felony theft cases are heard in the Kitsap County Superior Court, located in Port Orchard. Misdemeanor theft cases are heard in the Kitsap County District Court or the Bremerton Municipal Court. If you're a first-time offender, you may be eligible for a diversion program, which would prevent you or a loved one from acquiring a criminal record. An attorney may also be able to work out an arrangement with the prosecutor on your behalf that would minimize your punishments in some way. There is only one way to find out – contact one of our professional Bremerton theft attorneys for a free case evaluation and get the facts. If you maintain your innocence, we will aggressively defend your legal rights, as guaranteed by the Constitution of the United States. If you are hoping to mitigate the damage of a conviction, we will provide you with sound legal advice based on more than 50 years of collective criminal law experience.